The second day of a preliminary hearing for a decommissioned Metro Nashville police officer, who has been charged with criminal homicide in the shooting death of Daniel Hambrick, concluded Saturday. 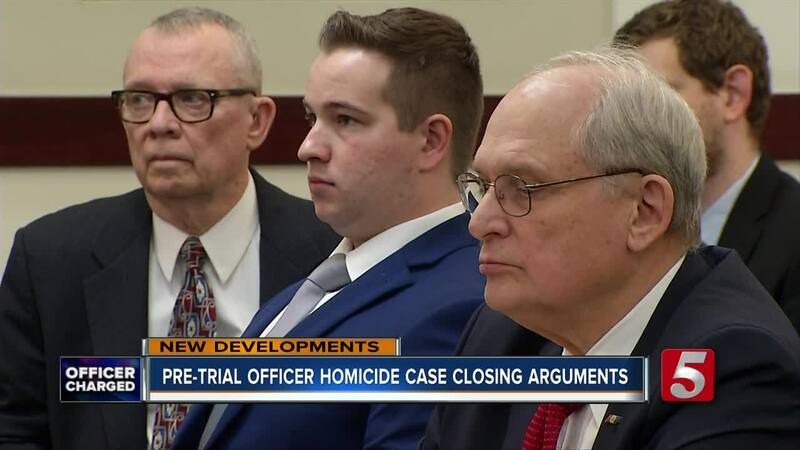 NASHVILLE, Tenn. (WTVF) — The second day of a preliminary hearing for a decommissioned Metro Nashville police officer, who has been charged with criminal homicide in the shooting death of Daniel Hambrick, concluded Saturday. General Sessions Judge Melissa Blackburn will announce on Monday her decision regarding whether or not there is enough evidence to bound the case over to a grand jury. During the second day, the defense started by asking Blackburn if she would allow additional surveillance camera pictures of Hambrick holding a gun into evidence. The defense said the pictures would show "relevant hand dominance" and how Hambrick may have transferred a gun in his hands while running away from Officer Delke. Blackburn initially allowed the three pictures to be part of evidence based on prior testimony but after the State responded, the judge recanted her decision after thoughtful consideration. The State is trying to prove that Andrew Delke, a white police officer, squared up and fired multiple rounds at the 25-year-old Hambrick, a black man, as he ran away. According to police, Hambrick led Delke on a short foot chase prior to the shooting that occurred back on July 26, 2018. On Friday, in a slow motion version of one camera angle, it showed what appeared to be a gun in Hambrick's right hand. However, the officer who responded to the scene said Hambrick had the gun clenched in his left hand when he fell down after being shot. The officer said he had to pull Hambrick's hand away from the gun before he was handcuffed. Robert Allen, a retired Metro police sergeant, was the first defense witness to speak on Saturday. Allen, who has 12 years of street experience, was called to share his expertise on police training and tactics. He said he had also reviewed Delke's training file. "The reason we don't shoot at arms and legs is A, it doesn't stop the threat, people get shot all the time in the arm and continue to fight and B, it creates a problem and it puts the public in grave jeopardy when bullets are missing a moving arm or leg," Allen said. Allen spoke about a training technique called a stable firing position. The State's District Attorney, Glen Funk, followed the defense by asking Allen that despite police training, was the decision to shoot Hambrick in the back solely's Delke's decision to which Allen agreed only because "the officer felt fearful." During closing arguments Nashville's Fraternal Order of Police attorney, David Raybin said, "There's only one number and one number only that's important in this case and that's the number of seconds it took Delke to dismount from his vehicle to the time of the shooting and if you look at the time of the videos it's 40 seconds." Deputy District Attorney Roger Moore, said there is enough evidence to have the case go before a grand jury. "Andrew Delke chased Daniel Hambrick until he decided he had chased him long enough and at that time submit he fired shot and killed Daniel Hambrick, not because he had to but because he chose to," Moore said. District Attorney Glen Funk said," there were a number of options that were available. Andrew Delke could have taken cover, Andrew Delke could have let Mr. Hambrick go and let the warrants division which is no secret serve a warrant for whatever traffic offense had led to this. But the bottom line is that any person in Davidson County who shoots someone who is running away from them, shoots them in the back and kills them, needs to be held accountable " Funk said. Before closing arguments the defense presented two prior criminal history charges of Hambrick's as evidence including when Hambrick was convicted of three counts of robbery in Aug 2010 and convicted of assault for throwing a stapler in a woman's face in 2010.